Pride, politics, passion, pain-are all manifested in the poetry of Azerbaijan. If you really want to know a man or his country, know his poetry. Mark Twain once said to know a man you must know his history. I believe the same applies to knowing a country. When I first thought about going to Baku back in 1992, my knowledge of Azerbaijan was extremely limited. Tourist guidebooks had little more than a single paragraph about Azerbaijan; history books were no where to be found. One of the first things I did when I arrived was to set out to discover as much as I could about my new homeland. And set out with a vengeance, I did. The Azeri character traits of hospitality and generosity soon became obvious as my new friends eagerly began searching for anything in English that related to their culture and history. Scouring tiny bookstores in back streets and alleys, as well as among gargantuan government publishing outlets, I finally discovered a little "kitab-khane" (book house) on a cobblestone lane just behind the Maiden's Tower. It was there that I first laid eyes on an anthology called "Azerbaijan Poetry," (edited by Mirza Ibrahimov, Progress Publishers: Moscow, 1982). The owner of the shop seemed rather surprised at seeing a blonde American gal in his little shop. He blinked behind his spectacles, but quickly understood that I was serious about buying one of the volumes off his dusty shelves. Carefully, he wrapped my selection in paper, tying it securely as if it were a precious work of art. Thus accommodated, I dared ask the price of what I feared would be a princely sum. Indeed! The price for my treasure-25 cents! For all 660 pages! Rushing home on the Metro, I fingered my new purchase, wondering what I would find between the covers of this rare volume. I was a bit familiar by then with the 12th century poet Nizami. I knew of the famous epic of Koroglu which was often staged in opera. I knew of Fizuli's tale of love and woe in "Leyli and Majnun" (a story written 400 years before Shakespeare's "Romeo and Juliet"). But what would shorter poetical works reveal? That evening passed so quickly as I savored each couplet and verse. The turn of each page brought insight into the past. I dreamed of maidens and cruel khans, nightingales and jewels, petaled roses and sharp sabers. The poetry spanned centuries of classical, traditional and modern verse. Truly, this was the stuff Azeris were made of. Gradually, I began to understand their passionate nature, their tendency towards poetic verbal expression, their vivid use of word pictures, and their inclination to romanticize about what seemed to be the most mundane detail of life. I wanted to share my newly found insights so I hurried back to the old man in his little dusty shop and bought every copy he owned. The next 25 foreigners that crossed my path received this volume. I handed them out like penny candy. Left: Statue of the beloved poetess, Natavan (19th century). This bullet-pocked bronze bust used to stand in Shusha, Natavan's native city, which is now under occupation by Armenians. Today, it is on exhibit in the courtyard close to the President's Aparat (Office Building). Let me introduce some of the rich morsels from those pages. Natavan (1830-97) is one of the most popular. Her real name was Khurshid-Banu, but she chose the pen name, "Natavan," which means "oppressed" especially after the tragic death of her son who died of tuberculosis when he was 15. Stories still circulate about how captivating a person she was, both in appearance and intellect. The famous French writer Alexander Dumas (the father) allegedly declared his love for her over a game of chess when passing through the town of Shusha (Azerbaijani territory now occupied by Armenians) in his travels along the Silk Route in the Caucasus. Dumas presented a gift to her that is now displayed in a Baku museum. Natavan writes of love and the beauty of nature, but most of her lines are permeated by the sense of loss of her son. Her poem, "To my Son, Abbas," is testimony to the relationship that exists between so many Azeri mothers and their sons-a bond that even death cannot sever. mourning its rose, sing I. To the earth from above. Had her son only lived long enough to join his bride-these were the experiences Natavan yearned for as a mother. In Azerbaijan, marriage is a sacred, long-anticipated milestone in the life of every family, not just individual who is marrying. Families start preparing for the occasion even before their daughters are in their early teens. Slowly and deliberately, they gather a dowry over the years from items they find on sale here and there or from special presents given to the family. Traditionally, the groom's family provides an apartment or house for the young couple, while the bride's family is responsible for all its furnishings. Should a young person die before marrying, a mirror which is traditionally part of the wedding table, is broken and placed on the grave to signify death. Visit the "Martyrs' Cemeteries" which have proliferated all around the country since the war, and you'll find many broken mirrors, evidence of too many broken dreams and too many broken hearts. The remaining pages of the anthology are filled with works of folklore such as "Dede Korkut" (Book of My Grandfather Korkut), heroic epics like "Kachag Nabi" (warriors and battles) and lyric prose from the wandering minstrels ("ashugs") of ancient days. The earlier poets wrote of love and beauty while the more modern writers of the Soviet period deal more with political issues and scenes from everyday life. Politics and poetry may seem like strange bedfellows but during Soviet times, political sentiment (propaganda) was expressed by poets willing to exchange ethics for existence or popularity. Often they had little choice. Statues were built throughout the Republics in the memory of both politicians and poets. Today, in Baku the memorials to poets remain while most of those commemorating politicians have been pulled down. One of the most famous statues is of Sabir (sah-BIR), a pre-Soviet writer (1862-1911). Originally, a monument was erected depicting Sabir in a standing position about 12 feet high in a tiny park just across from a statue to Nizami. The Soviets in that period (so the story goes) wanted only political figures to appear standing, so they re-cast Sabir in a sitting position. His poem, "To Moslem and Armenian Brothers," penned at the beginning of the 20th century is just as poignant and pertinent today as it was back then. Its opening line reads, "The spirit of the times demands that we unite, my friends," and is still shared by many Azerbaijanis today. For quarrels tear their land. 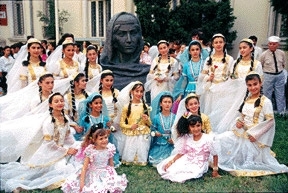 In Baku, despite the war and the resulting transfer of population between Armenia and Azerbaijan, you can still find Armenian women living in Baku who are married to Azerbaijani men. Of course, it only follows that there are numerous children born of these mixed marriages. So much more the reason for a solution to be found quickly to heal the rift between these two neighboring countries. Another characteristic in Azerbaijani poetry, of course, is love. Romantic at heart, Azeris are not shy in declaring their love. They often refer to the physical attributes of the women they love with melodious metaphor. Take, for instance, the imagery of Mollah-Panakh Vagif (1717-1797). Throughout the world, eyes yield so much meaning in their ability to communicate non-verbally. 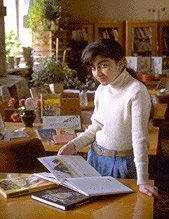 But to a Baku youth, even the "crescent moons" of a young woman's eyebrows seem to play a significant role. Perhaps such emphasis originated from the days (before the 1920s) when Azerbaijani women were traditionally veiled, and their eyes and brows were the most expressive visible features. Those practices still influence concepts of beauty today. One of my close Azerbaijani girlfriends doesn't pluck her thick dark brows simply because her mother considers them so attractive. Most traditional girls prefer to keep what nature gave them, at least, until they get married. However, quite a few Baku girls are beginning to re-shape those brows into a more international "covergirl" look. When I was a teenager I used to read a lot of swooningly romantic poems, but when I "grew up," I set them aside. After all, I wanted to pursue matters of more consequence. I felt I needed to concentrate on things that "really mattered" not "touchy-feely" emotional verse. When I picked up that anthology in Baku, it was the first time in years that I had paid attention to poetry. I found it rekindled tender thoughts and feelings that I had lost touch with or had been too busy or too shy to express. These poems opened many doors for me, provided tremendous insight into the history and politics of my newly adopted homeland and reflected character traits that I found in so many people around me. Somehow, in my frantically-paced world, reading those poetic lines helped me rediscover the things that really matter most in life-not the "Day-Timers," computer organizers, schedules, meetings and proposals but rather people and love, family and caring. It had been a long time since I had allowed myself to weep over poetry or pore over it by candlelight. Now that I'm 39, I'm realizing that after all those years in business that there is something far more important than hurtling headlong down freeways to meet deadlines. I've decided to pull off the road and take some time to "smell the roses."